Smorrebord (butter-bread), what they call the famous open-faced sandwiches of Denmark. This at a some-what fancy café in Copenhagen. Sandwich number 1 is Queen Victoria Cheese, rhubarb marmalade, toasted almonds and purple clover. Sandwich 2 is pickled herring, mayo, potatoes, dill, crunchy fried buckwheat and sweet pickled onion. 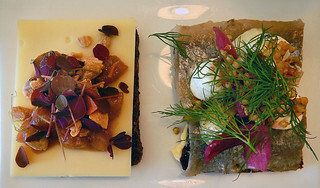 Both on thin slices of dense rye bread.